Just when it seemed Dundalk’s goal machine for 2018 could do little more to elevate his already hero status, Patrick Hoban received the ball in an area of the box no larger than the inside of a phone-booth before launching a precision missile off his weaker foot into the very bottom corner of the St.Pat’s net to not only break a seemingly untouchable goals record but in the process wrap up the “Town’s” fourth league title in five seasons. It seems almost unthinkable now that when the Galway native returned to these shores in the off-season there were critics far and wide questioning if the striker could find the sort of form, or even a fraction of it, that earned the target man a move to English football four-years ago. Hoban’s career path is as remarkable as the season he has just produced in all honesty. A steady yet far from eye catching member of Mervue United’s First Division newcomers from 2009-2012, Stephen Kenny raised many an eyebrow when he brought the Loughrea man to Oriel Park in 2013. Of course, it was a very different County Louth club to the one we know know, as a financial blackhole and ownership battles threatened to put the famous old provincial town club totally out of business. Famously surviving relegation by the skin of their teeth just a few months previous, many saw the arrival of Hoban as a bid to bolster the squad for another long & hard grind to avoid a dreaded drop that was just as likely to cripple the club as any other off-field issues at the time. However, fifteen league goals later and an unlikely runners-up place secured there was now a different smell in the air around the dilapidated Oriel Park, there was now a sense of belief as the crowds began to flock back to the Ardee Road venue as Stephen Kenny continued to sign players rejected by others before turning them into household names. 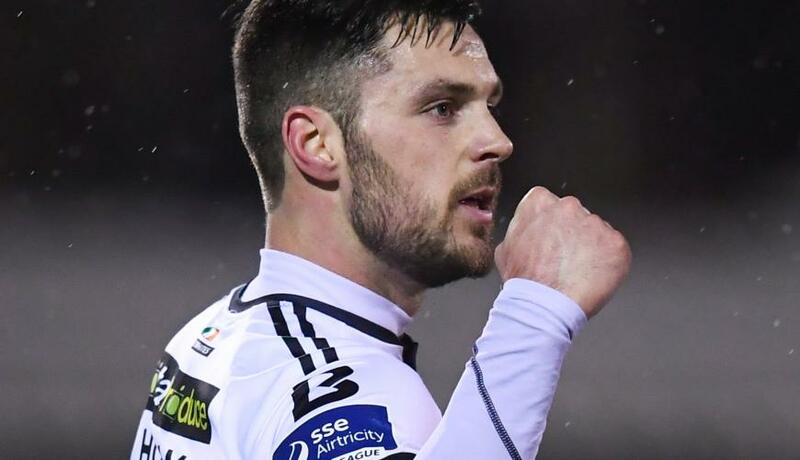 Hoban fitted that exact bill, scrapping around in the “graveyard division” unnoticed and unwanted for several seasons, Hoban’s tally of twenty league goals in 2014 brought the “Lilywhites” a first championship in nineteen long years and in the process alerted English clubs to his talents. However, injuries would ravage the target-mans four-year spell in England as Hoban went from club to club hoping against hope that the next move would be the right one and his fortunes would take a much needed turn. Scoring just seven league goals in that time, Hoban decided it was time to return to the place he felt most at home, outside of his own County of Galway of course, and with Stephen Kenny needing a replacement for his latest English bound striker in David McMillan, the timing couldn’t have been better for either party. A recording breaking twenty-six league goals later and with a second League of Ireland title to his credit the doubters are once again circling Hoban but this time on the basis he is not capable of an even greater step-up, the greatest step-up of all, that of international recognition. And to be fair, it is easy to see the argument. As much as Hoban’s performances and recording breaking feats have left onlookers breathless at times, there is always going to be references made to the twenty-seven-years-old’s unimpressive record in the English game. Despite being in the prime of his career, it is probably unlikely that British clubs will be queuing up for the now two-time golden boot winners services given his age, injury record and failure to settle abroad last time round. Also, given Martin O’Neill’s clear preference for Irish players to ply their trade in British football before receiving that much sought after international cap it looks unlikely that Hoban may earn the sort of recognition that rare exceptions to the rule like Seani Maguire, Andy Boyle, Daryl Horgan or Graham Burke did while still appearing on these shores. Age aside, what is the major difference between this seasons goal-scoring sensation and the names listed above during their respective League of Ireland careers? The answer is a strong or multiple impressive outings in Europe. Dundalk duo Horgan and Boyle earned their call-ups after O’Neill had witnessed and clearly been impressed by the “Lilywhites” historic Europa League group stage performances in 2016, while Burke and Maguire have both scored in European competition. While Stephen Kenny’s charges did manage to progress through a relatively tough round of the same competition they took by storm in 2016 this season, Hoban was overshadowed by team-mate Michael Duffy, who also has the distinct advantage of clearly being wanted by another nation, which should only strengthen the wingers chances of a perhaps sooner than expected senior Republic of Ireland call-up in the coming months. With the Republic of Ireland set to face Northern Ireland on November 14th at the Aviva Stadium in an international friendly, Hoban’s last throw of the dice in terms of a call-up this year may very well be the FAI Cup final at the same venue just a couple of weeks in advance of that international derby fixture. With the off-season in Irish domestic football a particularly long one it would be virtually impossible for Hoban to earn a call-up until well in to 2019 at the very earliest should he not feature against the North and with next year marking the start of competitive European qualifiers it would take a previously unseen u-turn from the Irish management team in calling up an uncapped League of Ireland player for games of such magnitude. So the case for Hoban’s exclusion is quite clear and even the most loyal supporters of the Dundalk striker would find it hard to argue against some of those points. However, such a possibility (League of Ireland call-ups) is no longer the distant dream it once was and given Martin O’Neill’s lack of options in forward areas nor should it be. Thankfully, with Preston’s Seani Maguire recently back to health after a lengthy and serious injury absence and with his North End team-mate, Callum Robinson in decent form, O’Neill’s issues aren’t as great as recent international breaks. However, the lack of Irish players scoring or even playing at a high level on a regular basis is still by far and away one of O’Neill’s greatest concerns (Declan Rice aside) and while one could argue Hoban does not fill that void in terms of competing at the highest level, perhaps that should be overlooked when you analyse exactly what traits the Dundallk striker would bring to the Irish table. With leg muscles as strong as tree-trunks, with an almost throwback aerial attribute matched only by his ability to bring team-mates into play an set-up goals with the same confidence he shows in finishing moves off, Patrick Hoban was built to play in the green jersey. And what does Martin O’Neill have to lose by at the very least taking a close up look at Hoban in action? While an often unpopular suggestion, what would it cost the Irish management team of Roy Keane and O’Neill to even invite Patrick Hoban into a senior Ireland training camp as done previously with the likes of Mark McNulty and Dundalk team-mate Gary Rogers? Again, it is understandable that the management duo may want to stick with the so called “tried and tested” in the upcoming Nations League games at home to Denmark and Wales, especially when you consider what two more negative results could do to the former Celtic men’s job security. However, should Patrick Hoban, who has now scored eighty-five career league goals, put on a performance in that Aviva Stadium showcase on November 4th that is typical of his 2018 form then it would be nothing short of football snobbery for Martin O’Neill to not give the league winner a serious examination at the very least. For the one thing all strikers have in common no matter if they play in front of the gleaming lights of the English Premier League or simply trot out for the local pub side is goals breed confidence and if you can show me another Irish striker as confident as Patrick Hoban right now I would be amazed. Also, have you heard our “Dundalk FC Champions again” podcast special? Dane Massey, Chris Shields & John Mountney all called in to chat with hosts Kieran & Jon to mark an incredible season for the “Lilywhites". Catch the show now by listening via our Audioboom player below. Alternatively, you can find the podcast on Itunes, SoundCloud, Spotify, Podcast Republic and others. Leave a review on Itunes and you will be entered into a free draw to win a Richie Towell print by LOI artist, Barry Masterson.